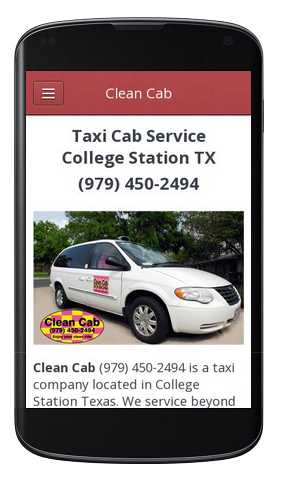 Taxi cab service in the twin cities of Bryan & College Station Tx, Home to Texas A&M University and Blinn College. 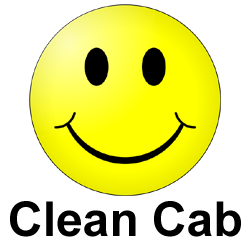 Clean Cab is a woman owned small business with competitive taxi fare rates. Our top priority is customer safety and satisfaction. We provide transportation to all of Brazos County Texas and surrounding communities. Clean Cab taxi also provides airport service to all major Texas cities. Our most requested out of town rides are to Austin and Houston airports. All long distance trips should always be booked at least a day ahead of time, although it&apos;s not mandatory. We cannot always assure there will be a taxi cab available on last minute notice. Sometimes we are overwhelmed with customer request for rides in our local community at the time of your call. Open 24 Hours, 7 Days a WeekExcept major holidays, or we have prior obligations. We are not only Taxi Drivers, we also have a family to manage.